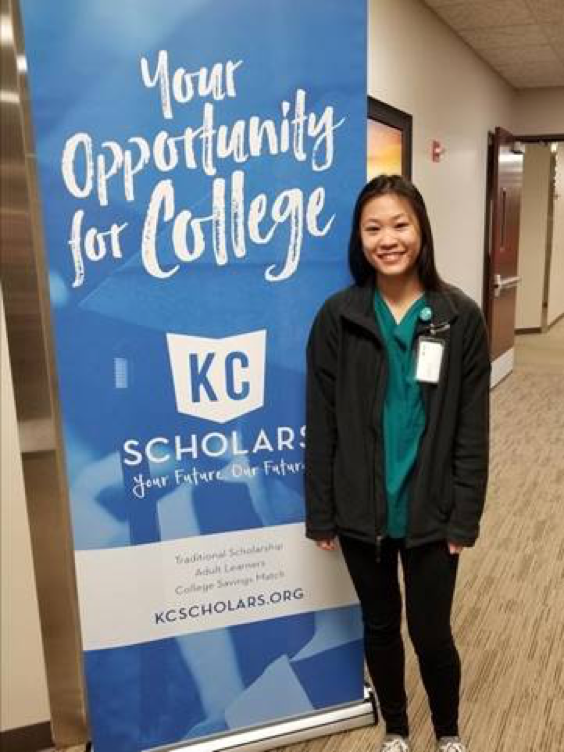 Above: Casey was working at the North Kansas City Hospital when KC Scholars hosted an informational luncheon for potential donors. She stopped by to say hello. Casey is one of 287 of the 11th graders awarded a Traditional Scholarship in May 2017. Casey is a graduate of Liberty High School where she was active in Key Club, National Honor Society, and Peer Mentors. She also worked at the North Kansas City Hospital and held other jobs during high school. She earned a 4.0 high school GPA and a 30 ACT score – which is in the top 95% of scores nationwide. Casey is the first in her family to pursue a college education. Casey is now enrolled at MU and studying Health Sciences. Her dream is to be a positive role model through her career in medicine. She wants to use her college degree and career in medicine to “keep our society moving forward.” Casey believes in establishing universal health care as a top priority for developing nations and desires to be part of that change. Casey’s parents are immigrants and came to the U.S. to search for the “American Dream.” Their struggles and sacrifices, when she was a child, inspired her to want to give back.